Santa Barbara’s newest buzz-worthy restaurant, The Boathouse (2981 Cliff Dr., 898-2628, boathousesb.com) at Hendry’s Beach, has staying power and is sure to become a staple on the dining scene. Formerly the home of the Brown Pelican, the prime coastal location is secluded and peaceful. Tom and Adam White, owners of FisHouse (101 E. Cabrillo Blvd.) and the Santa Barbara Shellfish Company (230 Stearns Wharf), have added a third restaurant to their portfolio as they continue to capitalize on prime real estate and the highest quality locally caught seafood. Aesthetically, the renovated space has a modern beach club feel with its clean whites, vibrant blues, glossy hard wood floors, and huge windows to magnificently capture the ocean view. 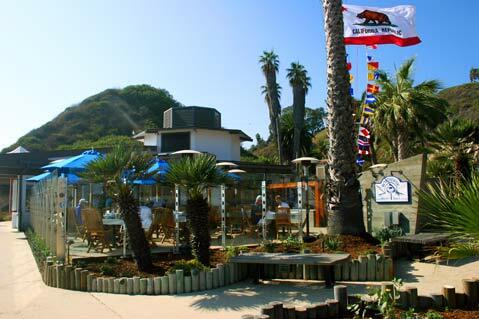 The circular bar, which has both indoor and outdoor seating, faces out toward the Channel Islands and rhythmically crashing white wash. A spacious patio surrounded by glass walls is full of heat lamps and electric blue umbrellas to provide comfortable al fresco dining all year long. Boathouse will be open for breakfast, lunch, and dinner featuring seasonal local fish dishes.